"Where there is no vision, the people perish,". . .(Proverbs 29:19). Thank God for Mr. John Henry "Buck" Smith, Sr., a man with a vision. Approximately eighty-eight years ago, Grandpa Buck felt the need of ". . . assembling ourselves together." 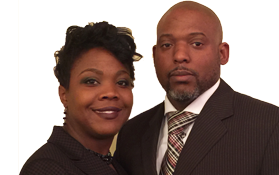 Consequently, people from the surrounding areas of Skunk Hollow, Redland Road and Clowney Place Communities began to congregate in his home to worship and praise God. Grandpa Buck's home was located behind a field across from Mrs. Maggie Sue Durrah's present home. Beds were taken down every week to provide ample space for service. For some time, only Sunday school was held. Although the congregation was virtually uneducated, they had enough insight to see the need of studying God's Word. "And I, if I be lifted up from the earth, will draw all men unto me" (St. John 12:32). The attendance grew as eager people traveled by foot, horse and buggy, and mules and wagons every week to "church" held in Grandpa Buck's home. Soon the one room church could no longer accommodate the vast number of growing worshippers. Services were then moved to a cotton house. God was continuing to bless these faithful people. Eventually, they built their first church. It was built out of hand-cut logs. Pretty soon this facility proved to be inadequate. Land was purchased from Mr. J. H. Clowney, a black man, at $20.00 per acre, and Mr. Robert Knuckles, father of Mr. Hezekiah Knuckles, donated the first $10.00 toward the construction of the new church. A "real" church with a tower bell was built on the property located in front of the present church's cemetery. Unfortunately, this church burned around 1933. This structure was completely destroyed. The bell cracked, but Mrs. Daisy Payton Smith managed to get the church's Bible; its pages were badly burned. In spite of this devastating experience, Grandpa Buck's vision continued to prevail. Services were moved to a schoolhouse in the community. Because of continuous contentions, a brush arbor was built. It was in this "church" where the first revival was held. As time evolved, another church was erected on the same property to replace the burned structure. This facility like all of the previous churches had no modern conveniences. It was heated with pot belly stoves, and drinking water was secured from a pump that was manually operated. Years passed, and Grandpa Buck's vision continued to flourish in the hearts and minds of his descendants, sisters and brothers in Christ. In 1960, plans were formulated to build a church with modern facilities. 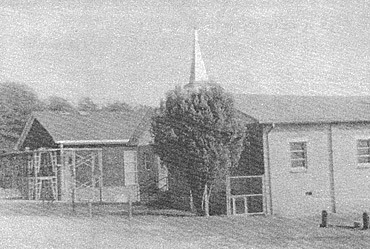 Land in the front of the old church was purchased from Mr. Casper Clowney, brother of Mr. J. H. Clowney. The church had enough money to pay cash for the property. Services were then moved to the Smith Chapel School which is still standing with reflections of fellowship, love and communion Mr. Nathaniel T. "Bubba" Smith, Sr., Mr. Perry Hendrix, Mr. Wardell Durrah, Mr. Thad L. Smith, Sr. and Mr. Hezekiah Knuckles signed a loan note to secure funds to finance this new church. This church was completed in 1963. The vision continued. Mr. Joe E. Smith, great grandson of Mr. John Henry "Buck" Smith, Sr., negotiated necessary transactions with Mr. and Mrs. C. B. Barre, who donated the property on which the present Smith Chapel Sanctuary, Fellowship Hall and Educational Department now stand. The first pastor to serve was Reverend Jim Suber. He was followed by Reverend J. H. Gilmore, who was from Jonesville, South Carolina. Reverend Gilmore could not drive; neither did he own a car. Once a month, he boarded a train from Jonesville to Campobello and was picked up by one of the church officers who met him at the depot. Oftentimes he came up on Saturday's and spent the night with some of the members. Reverend Gilmore served until his death in 1953. His tenure was followed by Reverend James R. Whitmore from Laurens, South Carolina, the first pastor with a car. His pastorship was followed by Reverend A. C. Philson, Reverend Jimmy Kerns, both of Spartanburg, South Carolina, and Reverend Harrison Gregory of Greer, South Carolina. Reverend J. Calvin Hill, also of Greer, South Carolina, is the present pastor and has served since May 1977. For years, worship services consisted of Sunday School every Sunday and preaching every third Sunday of each month. Under the leadership of Reverend A. C. Philson, preaching was moved to first and third Sunday's in each month. The vision continued to expand, and under the leadership of the present pastor, preaching became a part of the worship service every Sunday. The first deacons to serve were Mr. John Henry (Buck) Smith, Sr. and Mr. Henry Bobo. Other deacons who have served during the span of the church's history are Mr. Lodan Foster, Mr. Sam Hendrix, Mr. Durrah Payton, Mr. Nathaniel T. "Bubba" Smith, Sr., Mr. John Henry Smith, Jr., Mr. Wardell Durrah, all of whom are deceased, and Mr. Sidney Joe Mills who accepted the "call" and is pastoring Friendship Baptist Church in Camden, New Jersey. The present officers are Mr. Thad L. Smith, Sr., Chairman, Mr. Hezekiah Knuckles, Mr. John Lee Landrum, Mr. Howard C. Durrah, Mr. Willie Bell, Mr. Thad L. Smith, Jr., Mr. Richard Mills and Mr. William Fred Mills. The first Mother of the Church was Mrs. Nannie Little, mother of the oldest living member, Mrs. Oneal Hall. After Mrs. Little's death, Mrs. Daisy Payton Smith, who is also deceased, was selected to serve. Mrs. Ethel Mills serves as Mother of the Church today. Just like today, singing played a major role in the worship services of the early churches. Voices could be heard from a distance shouting praises through the singing of "Do, Mi, Sol, Do" songs. Because of the continuing vision, today's church is comprised of many auxiliaries which include five choirs. Mr. John Henry "Buck" Smith, Sr. fellow laborers loved him very much. Because of their tremendous admiration and respect for him, the church was named in his honor, SMITH CHAPEL BAPTIST CHURCH. Mrs. Nannie Little, Mrs. Moriah Robinson, Mrs. Lois Jackson, Mrs. Ella Hendrix, Mrs. Corine Smith and Mrs. Daisy P. Smith, all of whom are deceased, often reminisced about the beginnings of committee was elected and plans were begun immediately to build another church. "Except the Lord build the house, they labor in vain that build it;". . .(Psalms 127:1). The dream became a reality five years later. Because of a vision that began more than eight decades ago, the Smith Chapel Baptist Church Family proudly celebrates with VICTORY, DEDICATION 1988''''''' Thank God for Grandpa Buck, a man with an INCREDIBLE VISION!!! !